Synopsis: Danger. Betrayal. Destiny. Passion. The superb sequel to BLOOD RED ROAD, the most exciting YA debut of 2011 Saba has rescued her kidnapped brother and defeated the fanatical Tonton. But the price to be paid for her violent victory is terible. Jack has disappeared - and can no longer be trusted. A new and formidable enemy is on the rise in the dustlands. No one i safe. And Saba must confront the terrible secret hidden in the darkest depths of her soul. When Blood Red Road came on the market this time last year, readers and reviewers alike had a hard time assigning the novel a genre – was it dystopian or post apocalyptic? Fantasy with touches of a western? Or something else entirely? Either way, it captured the hearts of its many readers and went on to win the Costa Book Award in the childrens/YA category, one of the most prestigious awards in the UK industry that seeks to reward books that are entertaining and possess literary merit, something that Blood Red Road with its thrilling tale of love and death managed to do. So what of Rebel Heart? If Blood Red Road was a tale of perseverance and familial love, is Rebel Heart a tale of passion? It would certainly seem so, as Jack bears grave news to his friend Ike’s former lover, and in the process is snapped from Saba’s life only to leave her pining and desperate to find him. Of course, things are never that simple and as many complications as chapters come in the way of their love for each other. Rebel Heart is the second novel of a trilogy, a position that has become synonymous with novels that are a little less ferocious and passionate than their predecessor and less climactic than the final novel. Thankfully, Rebel Heart doesn’t suffer from the shortfalls that burden other second novels (most recently, that has been Insurgent, the sequel to Divergent) and Young powers on through the story. However, it is also important to note that Rebel Heart is different from its predecessor, taking a slightly less action-based road and focusing more on the characters as well as changing the tone from a post-apocalyptic western to a more fantasy-based dystopian tale. Young writes some of the best prose I have read in a long time and I cannot stress what a delight it is to be immersed in her writing again. There’s a reason Blood Red Road won a Costa, and that’s because it features such a rich and immersive prose that is filled with Saba’s zeal for her friends and family. And although some people have criticised Young’s use of dialect in Blood Red Road, I found it a fantastic and vital edition to the story-telling, perfect for expressing character and setting. 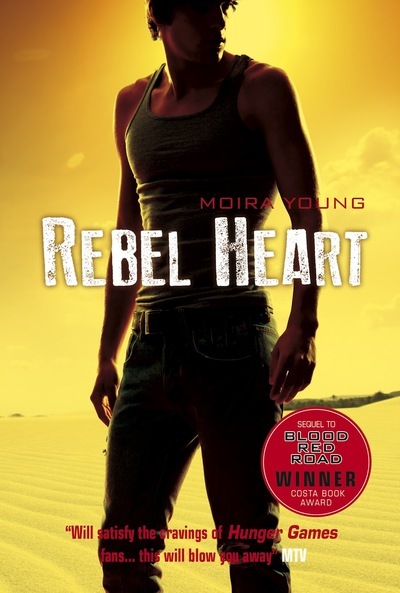 Rebel Heart ends on both a heartbreaking and sinister note, but what they both share is a heart for character. Saba, now reunited with Lugh, has come to realise that things will never be the same again and Jack’s absence is hitting her hard. Whilst Saba was strong and focused in her pursuit to regain her brother, direction-less, she is as confused as a hare caught in the vicious stare of headlights. Tommo is starting to grow out of his childlike worship of Ike in Blood Red Road, and Emmi has become an intelligent and strong young girl. As for Jack: let’s just say I don’t want to spoil anything! Moira Young has once again delivered a powerful, thrilling and heartbreaking tale that transcends genres. Filled with fantastic character developments, failures and successes, Rebel Heart is the sequel that Blood Red Road deserves and a novel that cements Young firmly amongst her acclaimed contemporaries. Book three cannot come fast enough!